The kit includes: 1 pc. screw, 1 pc. plate, 3 pcs. nuts M10, 1 pc. insulating rubber gasket. 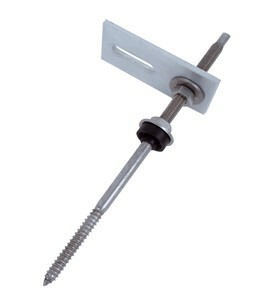 Stud with adapter plate is used for mounting solar modules on pitchedroofs withwaterproofibitumen. Studs engage in capitals in order to fit over asuitable aluminum profile. The height of the profile relative to the plane of the roofcould be regulated through metric thread, and through the oval hole of the plate in smaller range it is possible adjustment so the profile could be in a straight line.At its upper end , the stud has a hexagon which enables the use of a wrench, or machine for screwing the stud , which in turn facilitates the assembly of the system.